Many Nexus smartphone and tablet owners are experiencing poor battery life after the update to Android Nougat. With that in mind, today we’ll go over some common battery life problems and offer tips on how to fix them. This guide will cover the Nexus 5x, Nexus 6P, Nexus 6, Nexus 9, Pixel C and more. Including Android 7.1.2 Nougat issues and the Google Pixel. Android Nougat delivers a slew of exciting new features like split-screen mode, instant apps, and revamped notifications. Sadly, the update isn’t perfect and instead of improving battery life it’s making it worse for some. Heading over to Reddit or even the official Google forum bug tracker, you’ll see lots of complaints about a wide array of problems. Most notably Nexus Android 7.0 battery life issues. Abnormal battery drain is a common problem, especially after big software updates. We’re here to try to help solve some of the bad Nexus Android 7.0 battery life problems users are experiencing. Android 7.1.1 and 7.1.2 fixed a lot of bugs, but some remain. The first thing users should do if battery life is a problem is check for rogue apps. This could be a malfunctioning app that isn’t ready to run right with Nougat, an app keeping the system awake, or other things. Typically heading to settings > battery > and looking at the list of apps draining battery you’ll get a good idea of what’s going on. Android System or the Screen (Display) are usually at the top of the list, but we’ve been seeing a problem where “Android OS” is taking the most, followed by Android System. One should be there, the other should not. Android System is typically one of the higher drains, but not the OS. While Google services or Android System often take up the battery to perform important tasks in the operating system, you should not see Android OS at the top. Furthermore, screen brightness is typically what’s at the top of the list. If it’s not, something isn’t right. As for a fix, oddly enough one is to turn off Bluetooth if you don’t need it. Android Wear, Android Auto, and other devices require Bluetooth, but many users have noticed substantially better battery life with Bluetooth turned off. Check the list of apps in the battery settings to see if anything else is causing drain. Apps like Facebook and Snapchat can often be the problem as well, so keep that in mind. Selecting an app and hitting “Force Stop” can kill the process and improve battery, but don’t kill anything unless you know what it does. Reinstalling an app that is misbehaving is also another good idea. Lastly, try booting into Safe Mode. Safe Mode will disable third-party applications and that will allow you to narrow your search to find any potential problems. Similar to apps draining your battery as mentioned above, apps being synced and backed up could be the culprit too. Multiple users on Reddit noticed that on the Nexus 6P the device wasn’t syncing right, causing huge drains in battery life. Imagine your phone trying to sync to the cloud and save all of your contacts, photos, Google Drive documents or Google music over and over again. That will surely affect battery life. The user recommends heading into Settings > Accounts > and looking for any that have the sync icon or a (!) next to them, suggesting sync had failed. To make matters worse, manually refreshing accounts to sync didn’t fix the problem. One owner went into each Google account sync option and did it manually. For Google Drive, fit, photos, music, keep, and even 3rd party apps like Skype, and re-synced each one. Multiple users have noticed substantially improved Nexus battery life after doing this. To take this further, Skype sync was causing the problem for a few users, so be sure to check any and all apps and accounts to make sure sync is working. Then, continue on for the rest of our tips. If your apps are functioning properly try disabling unnecessary services on your Nexus phone or tablet. Disabling connections and other services when you aren’t using them could save you some battery life. We mentioned Bluetooth above and will say it again. Actually, we’re seeing a lot of complaints about Bluetooth problems, and some of those could be causing battery drain. Turn if off if you don’t need it. We highly recommend shutting off Wi-Fi connectivity, Bluetooth, NFC, GPS, and cellular data when you don’t need them turned on. You can turn those off from the Nexus’ quick settings menu or you can turn them off from the regular Settings menu. It seems with each update a small group complains about Bluetooth issues. Another idea is to change location settings to “Battery Saver Mode” which uses WiFi and networks instead of GPS. That is because GPS will hog any and all battery. If you’re in a poor signal area, try switching on Airplane Mode. Airplane Mode will kill all of your device’s services but it could prevent battery drain. When you have no service the phone will constantly look for one, so turn on Airplane mode and save juice for later. In fact, most phones can last 4-5 days on Airplane mode. Occasionally apps will just start draining the battery, or even Android System and OS when it shouldn’t. If I’ve removed my Nexus (or any Android) from the charger and it is draining faster than expected, I do a quick reboot. This usually fixes any random problem killing the battery. Hold down the power button and turn it off, then back on, or hit reboot on select devices. This starts the entire system fresh and can solve a lot of little bugs including bad Nexus battery life. It sounds silly, but I reboot my phone once every 2-3 days, for the best experience. This is one everyone should know and isn’t really a tip, but I constantly see users with a phone set around 90-100% brightness. Full brightness isn’t needed on most devices, even outdoors. Instead, try setting it around 35-40% brightness and watch how much longer the phone lasts. Head into Settings > Display > and uncheck auto, then put the slider to a more manageable and realistic brightness setting. It may take a few hours to get used to the lower screen level, but your battery will thank you for it. If none of those work, you can take some more drastic steps towards fixing your bad Nexus Android Nougat battery life. One of those steps is clearing the cache partition. While holding Power button tap Volume Up once then release the Power button. You should now see a list of items at top of screen and will be in “Recovery mode”. Tap Volume Down until you reach the option to clear cache partition. Tap the Power button to select, confirm by hitting yes, and let it finish. Progress messages will appear at the bottom of the screen. This should take less than a minute but could take upwards of 10 minutes in some cases. This has shown to fix multiple small problems after a software update. From battery life to WiFi and Bluetooth issues, GPS glitches, and multiple other small things. We’d recommend doing this after any big update, so your Nexus can start with a clean slate. This is the last resort, but like clearing the Cache it is also a great idea to start with a clean slate and wipe out any unwanted leftover files. Doing a factory data reset will erase everything, so backup any important files first, and be prepared to set aside an hour or so to set up your phone back to how it was. Most should know how to do a reset, if not, Google has put together an extensive guide that outlines the proper way to factor reset Nexus smartphones and tablets. Take a look at that information, backup your device, and get started. If you absolutely need better battery life and can’t fix it with any of these suggestions, and can’t wait for Google to release an update to Android 7.1.2 Nougat, some owners can always revert back to Android 6.0.1 Marshmallow. 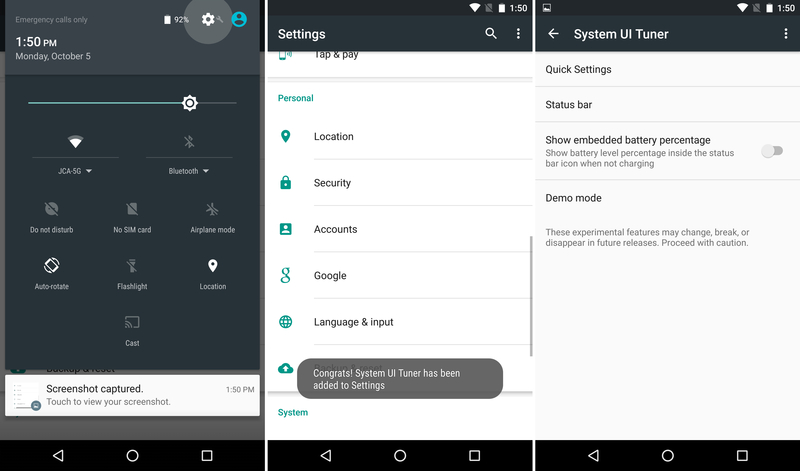 This guide explains how to manually install Android Nougat, but the same instructions (and factory images link) will allow users to download any version of Android 6.0 and install it within 10-15 minute. Use that to downgrade back to Marshmallow if you don’t need Nougat, and want better Nexus battery life. I wouldn’t recommend it but to each their own. The next logical step is to try the recent update to Android O, which is available now as an early preview beta. Android O delivers a slew of new features, improvements, bug fixes, and made major changes to improve battery life. Apps can’t just run in the background, as the operating system limits them after a set period of time. Users will enjoy plenty of new features, and hopefully better battery life too. Android O isn’t perfect, and still beta software, but it could improve your experience drastically. Here’s how to install Android O today. If none of this seems to work, try tracking down another fix. Google’s Nexus Help Forums are a great place to start. There are tons of helpful users on XDA-Developers not to mention custom 3rd party versions of Android you can install that may have better results. We also recommend getting a Portable Battery Pack that can recharge your device anywhere and everywhere, which isn’t ideal, but a great accessory to have anyways. We’ll be on the lookout for more complaints, details, possible fixes, and report back once we know more. Are you experiencing bad Nexus Android Nougat battery life? Let us know in the comments below. It says wipe cache partition not clear cache partition. With the latest beta; the Nexus 6 instantly shuts down when it reaches 15% and requires charging before being able to start up. Today, it instantly shut down at 75% and required charging before starting up. I charged it for a minute, and has now been able to drain it below 75% without any issue. But this is really annoying when going out, and it shuts down at 75%!! Maybe I need to do a factory reset. But I would also like to have the full release of Nougat first; and then do a full reset. This is definitely a problem. Today is my first day on Nougat and the battery drain is very clear. Not using the device any differently. When I check battery settings, there is Android System and Android OS right at the top. I don’t have blue tooth on. Screen is at 5 percent. Its just terrible. First, was complaining that I didn’t have Nougat…and now I wish I never got it. And calling Google Support is useless. Those reps don’t know what they’re talking about and can’t resolve any problems. So much complexity. I am glad I delayed the nougat update on my nexus phone. I have gotten my Marshmallow devices to do what I want and they all have a perfect battery life. I’ll let others to be guinea pigs for the 7.0, and will upgrade maybe a year later as it seems like Google has release yet another half baked Android update. Joey, in developer options, disable automatic system updates. This did the trick for me. Went from 7 hrs back to all day battery. I’ve tried everything, even so-called “developer options”, but nothing helps reach the goal with 6.0.1 or 7.0. When i first got the phone (nexus 5x), it was able to be working for 5-8 days!!! Yes, i am not very active user. 5-10 calls 10-20 min of music, 1-2 card transactions (i’m far more 40 ;-). AT LEAST 5 DAYS! The only thing that helped in my case was the downgrade to the oldest available 6.0.0! But even first upgrade of 6.0.0 applications (as well as google services) got my phone back to where i was before. DO NOT UPGRADE GOOGLE SERVICES AFTER YOU HAVE DOWNGRADED TO 6.0.0!! IT IS THE ROOT OF ALL PROBLEMS!! as i think ;-) 20+ hours of working-as-expected!! yahoooo! If you get upgraded to the next version of google services, remember that you can safely return to the original version. You just have to Disable-Remove Upgrade Google Services, and then re-Enable GS, as well as another google apps which functionality depends on G-services too much (calendar, disk, contacts, camera, gmail and some others). And the next fly in the plate of soup is the fact that you will be unable to install some newer apps from google (such as “Google duo”). Your choose. Unfortunately, my next experiment failed. After a few days, everything was as it was before flashing. Looks like Big Brother in my phone never sleeps. Well nougat 7.0 nearly killed the nexus 5x. The battery drained rapidly and the device refused to charge properly. I made a backup of the device as the first step. Then I used The Nexus Rootkit Tool ver 2.19 (latest). The device was rooted by following the given instructions in the tool. Then I waited for the device to come around and prepairing apps and the like. Then I flashed the build to ver 6.01 (last stable build stock ROM). Rebooted the device. The next step is very important. I configured the device as a new device.Wait for the device to fully prepare and install apks. DO NOT UPDATE before everything is updated an running in build 6.01 this includes all apks and wifi. The device might be stable at this point – however it may warn You of it being unable to check for corrupted software (unlocked bootloader) or even the device itself being corrupted at boot up. Just ignore it for the time being. With all the above done, then and only then I used the OTA update to ver 7.11. This worked for me. It takes some time. Patience is very impotant – don´t try to rush anything. I´ve tried a lot of different approaches. You should be able to relock the bootloader, however I went straight back into problems. Then again I can live with an unlocked bootloader which offers more possibilities/options including bricking again. I´ve not tested the method on other devices. In general You´ve got a fighting chance – if You can revert back to a stable release and get it running and proceed from there. The tools may vary a bit even for the same devices running the exact same builds. Some tools require the device to be only charging on USB – others MTP. Some tools may even use diffrent methods within the problemsolving – adb sideload, fastboot or download mode eg. You might even have to try different tools, one for fixing bootloader, another one for recovery eg. Trying different forums is a very good beginning when trying to figure out, what may work or not for Your specific model and/ROM/problems. Performing the above steps is at Your own risk. By performing the above steps You´ve readily accepted the risk of failiure and bricking the device. Failiure is always an option..
7.0 was one of the worst halfbacked upgrades I´ve ever seen. Even upgrading to 7.11 didn´t fix it. 7.11 is outperforming 6.0 any day. For the time being the only solution seems to be going back to 6.0 and upgrade directly to 7.11. – 7.0 is by all means a no go. Even upgrading to 7.11 can´t fix the mess left by 7.0 – The 7.11 is very impressive and improves battery life. I´ve seen the nexus 5 x go from less than 1 hr SOT to 4 hrs. This article was useless. Doesn’t provide any solid ways to fix the actual issues. Just provides generic solutions applicable to any phone and any software. Please do not clutter the internet or waste our time with such useless articles. There was never a bug called “Misc. Battery” Or a “Wi-Fi bug”. Google Tricked everyone beautifully. To your surprise, the bug fix was actually hiding the mis calculation that was considered as a battery drain bug. Have a Nexus 6P that wouldn’t last more than 4 hours with Nougat. Upgraded to Android O beta last weekend. The first full day after the upgrade, after 15 hours on battery I was still at 50% battery life!!!! No factory reset, no turning anything else off, just a quick upgrade.